Mount Fuji, Japan's iconic mountain, has been designated as a UNESCO World Heritage Site in 2013. This article tells you all you need to know about visiting and climbing Mount Fuji safely and shows you the best routes up the mountain. Mt. Fuji is a Japanese icon, rising to the altitude of 3,776 meters. It is the tallest mountain in Japan, and gathers twenty to thirty thousand climbers every year. However, due to the increase in climbers, a number of accidents, incidents, and environmental damage has occurred. From the trailhead, the climb takes about six to seven hours to the summit. There are mountain huts where you can rest along the well-maintained trail, so Mt. Fuji is fit for intermediate level climbers. For well-prepared climbers with experience, the climb should take one to two days. Beginners should be well aware of the various risks. Accidents and health problems may occur if you try to climb Mt. Fuji casually. These kinds of difficulties will also vary according to the trail and the timing. If you are interested in climbing Mt. Fuji, please be aware of the difficulties as well as the rules and manners which must be followed. This article will detail the climbing season, recommended trails and necessary equipment. 7. How to Climb Mt. Fuji Safely? There are timely restrictions concerning climbing Mt. Fuji. The climbing season starts early July and ends early September. Aside from this timeframe, the mountain is closed due to safety reasons. During the closed period, the temperature often drops below zero degrees Celsius. The mountain huts and toilets along the trail will also likely be closed. There will be no other climbers and rescue missions will be difficult. For all of these reasons, it would be wise not to climb during the closed season. Please also note that the climbing season differs depending on the trail. Normally, the Yoshida Trail opens around July 1st and closes around September 10th. The Subashiri/Gotemba/Fujinomiya Trails open around July 10th and close around September 10th. After Mt. Fuji opens its hiking trails on July 1st, the number of climbers gradually increases. the trails will generally be very crowded in mid-August. Most weekends during the climbing season will also be very busy, as most Japanese climbers tend to make use of their days off. If you prefer to climb under less-crowded conditions, try to schedule your visit to Mt. Fuji on weekdays. There are various trails leading up to Mt. Fuji. As the mountain spans between Yamanashi and Shizuoka Prefectures, there are trailheads on both sides. The access differs depending on the trailhead. Following you can find a list of trails leading up to the summit. Please note that the time is a rough estimate. Beginners should add ten to twenty percent extra time to this estimate. Though it is possible to climb Mt. Fuji in one day, it will require a tight schedule and a lot of strength. If you are a beginner, it is recommended to stay somewhere along the trail for one night, no matter which trail you choose. This is the most popular trail and it's easy to climb. There are many huts along the route, making it perfect for beginners. Please be aware that this route will be crowded during high season, and the arrival at the summit may be delayed. 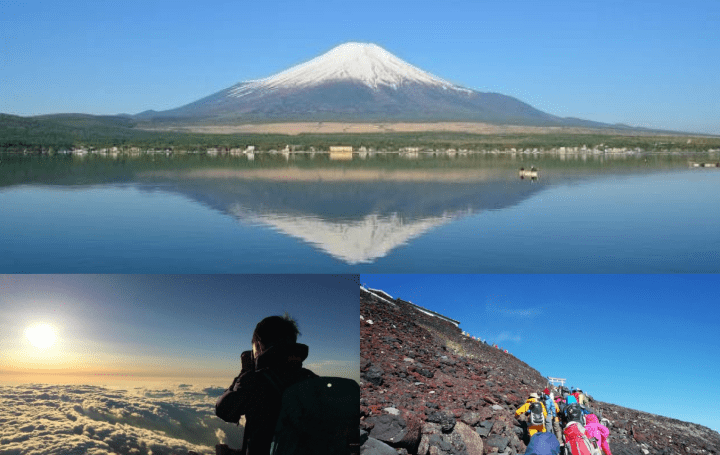 For further information, please read: The Complete Guide to Climbing Mount Fuji (Yoshida Trail). The second most popular trail after Yoshida, as this is the shortest route, with less climbing time compared to other trails. Please note that note the trail is steep, so it will require a lot of strength. A less popular trail compared to Yoshida and Fujinomiya but not so crowded as a result. The trail goes through a verdant area, so it is recommended for climbers who also wish to see alpine plants during their climb. Subashiri is famous for its descent route. A steep area called "Sunabashiri" (sand running), where the climbers can run down a route covered in gravel is especially popular. If you choose this trail, be careful not to fall down on your way back. A route that will take long hours to climb. The incline is gentle, so the risk of altitude sickness is comparably low. Just like Subashiri, the descent route is full of gravel-covered areas, where the climbers can try "sand running." The Yoshida and Fujinomiya trails tend to be crowded, especially at night when the climbers try to view the goraiko (*1) in the morning. The Subashiri (before it merges with the Yoshida) and the Gotemba trail are less crowded than the Yoshida and the Fujinomiya trail, so please choose depending on your preference. *1 Goraiko: Sunrise viewed from the mountain. One of the highlights of climbing Mt. Fuji. Beginners should choose a relatively crowded trail, as it would be easy to ask for help. When planning on climbing Mt.Fuji, beginners should keep the following three things in mind. 2. Choose a relatively crowded trail. The following plan is based on the points mentioned above. The time required is a rough estimate. It is subject to change, depending on the climbers' experience. Climbing Hours: About eight hours for the ascent and four hours for the descent. This plan will take the Yoshida Trail, used by nearly half the Mt. Fuji climbers. Although the incline is steeper than the Gotemba Trail, Yoshida is more crowded, so in case of trouble, you will be able to ask the fellow climbers for help. It also offers easy access to the trailhead from Fuji Subaru Line Fifth Station. There are mountain huts and kiosks on the ascent trail, which can be helpful for the beginner climbers. Start your climb after lunch at the trailhead. After a three to four hours climb, you will reach the seventh or eighth station. After the long climb, you will be having a rest period at the mountain hut. Please note that a reservations must be made in advance. At the hut, make sure to recover from the climb and get accustomed to the high altitude. Enjoy the sunset from Mt. Fuji. Bedtime should be early, in order to view the goraiko in the morning. Dinner will be around 19:00 and bedtime should be at 20:00, at the latest. Dinnertime will differ according to the hut. Climbers arriving late at the hut may miss out on dinner, so check the meal hours when making reservations. Sunrise will be around 5:00. If you feel strong enough, wake up at midnight and head for the summit. If not, get some sleep and watch the goraiko from the hut. The climb to the summit will take three to four hours. Watch the goraiko from the hut and feel its mystic energy. Ohachi meguri, for the climbers who still have their strength after reaching the summit. The climb to the summit from the seventh or eighth station should take about four hours. Climbers who still feel strong enough should try what is known as ohachi meguri, a walk around the crater rim of Mt. Fuji, at the summit. This is a staple activity for climbers who want to feel the dynamic atmosphere of Mt. Fuji. After enjoying the scenery at the summit, it's time to descend, which should take about three to four hours. Although it will be faster than the ascent, the burden on the knees will be greater, so be careful not to fall and hurt yourself. A guide might lessen the anxiety of climbing alone. With careful preparation, even beginner climbers can enjoy Mt. Fuji. If you hope to avoid any possible trouble or learn more about Mt. Fuji while you climbing it, joining a guided tour might be a good idea. Willer Travel and Hankyu Travel offer such tours. The following is a list of necessary items for the climb. Boots The trails at Mt. Fuji are well-maintained, but the long trek will be a great burden on the legs. Choose boots that will protect your feet. They should not be too tight and ideally, the boots should be waterproof. Rainwear The weather changes suddenly in the mountains, so bring a rainwear, even if it's a sunny day. Make sure to choose the right size to accommodate multiple layers of clothing. Hat or Bandanna The summer sun in Japan is harsh and can cause heat stroke. Make sure to wear a wide-brimmed hat or a bandanna. Gloves The trails of Mt. Fuji are uneven and gloves will be necessary to prevent injuries. They will also protect the hands from the cold the further you get to the summit. Winter Clothing Although the climbing season is in summer, the temperature at the summit is only about five degrees Celsius. Climbers should dress accordingly to this climate. Underwear Perspiration will lower your body temperature while you are resting. Make sure to bring some extra underwear to change into. Pants Cotton clothing such as jeans lack elasticity and take time to dry. Climbers should wear mountaineering or trekking pants. Headlight To view the goraiko at the summit, climbers will have to trek in the dark. Also, the climb may not proceed as planned, so it would be wise to bring lights with you. A headlight would be best, as a flashlight has to be held by hand. Backpack At some point, climbers may have to use their hands along the trail. It would be wise to choose a backpack, which allows the use of both hands. A thirty liter-sized bag should be big enough. Toilet Fee: 100 to 300 yen. This will be required at the mountain huts. Food and Drink: There will be kiosks at the hut. Please note that the price will rise close to the summit. For instance, a 100 yen beverage will cost about 500 yen at the top. *2 Climbers will be asked to pay an access fee (a donation to the Fujisan Conservation Fund) at Mt. Fuji. The money will be used to maintain the safety of the climbers and preserving the environment. The fee will be collected at the General Information Center (Fuji Subaru Line Fifth Stage) or Safety Guidance Center (Yoshida Trail Sixth Stage). Water To keep yourself hydrated during the climb, you should carry one to two liters of water in a canteen or a PET bottle. The water sold at the kiosks may cost up to 500 yen, depending on where you buy it. Provisions Bring snacks with high sugar content, such as chocolate or candy, as this will help you to recover from fatigue. Toilet Paper There are toilets equipped with paper along the trail, but it may run out due to the number of climbers. It would be safe to have some paper with you, just in case. Map This is a necessary item to check the route, and locations of huts and toilets along the trail. Sunscreen A must-carry item for those who want to avoid sunburn, as the climbers will be exposed to the sun for long hours. Coin Purse Keep some coins ready, separately from a wallet in order to use at toilets or to buy drinks and snacks. Wet Wipes As drinking water is precious in the mountains, this item will be useful when wiping off dirt. Sunglasses To protect the eyes as ultraviolet rays will become stronger with altitude. Alpenstock This item will make the trekking easier. Sleeping Bag Liner An item to improve the thermal insulation of the rental sleeping bags at the hut. It will also work as an extra layer for sleeping bags that may be well-used. Portable Oxygen This will come in handy in case of altitude sickness. Earplugs In case other climbers snore at night. Yamarent and Soranoshita trail both offer a rental service of mountain gears. Their websites are available in Japanese, English, and Chinese. The temperature can change drastically at Mt. Fuji. Thunder and heavy wind will often occur. * These photographs are only for illustrative purposes. The weather at Mt. Fuji changes drastically in a short period. Check the weather forecasts before the climb and pack rainwear as well as thermal wear, even if the day is clear. In case of the weather changing for the worse during the climb, you might also want to think about descending. Mt. Fuji Climbing Official Site offers the latest disaster information, so make sure to check the site before the climb. At Mt. Fuji, the temperature drops about 0.6 degrees Celsius every 100 meters, resulting in a difference of twenty degrees Celsius between the summit and the foothills. The temperature will drop further at night and in the early morning. At the time of the goraiko, around 5:00, the temperature at the summit sometimes drops to zero degrees Celsius. To avoid hypothermia, climbers should dress accordingly. Thunderstorms often occur at Mt. Fuji. When the weather deteriorates and you see dark clouds alongside the rumbling sounds of thunder, head for the nearest hut. You cant protect yourself from the strong winds blowing at Mt. Fuji. Climbers may fall down if the footing is bad, and hypothermia may occur as the body temperature drops. Evacuate to the nearest hut and if you do not feel strong enough think about descending. How to Climb Mt. Fuji Safely? Money will be needed for the services at the mountain hut. There are mountain huts along the trails of Mt. Fuji. Climbers should use them appropriately to rest and recharge. Please keep in mind that the huts are simple lodging houses and not hotels. Climbers will have to bring most necessary items by themselves. The huts will be crowded during high season, so it would be safe to make reservations. The fare for an overnight stay without a meal is 5,000 yen and up, and 7,000 to 10,000 yen including two meals. Most huts do not accept credit cards, so payments will have to be in cash. All the toilets along the trail collect a fee ranging from 100 to 300 yen, so it would be best to have some coins ready. As the toilets tend to be crowded, some climbers refrain from using it. Some even stop drinking water. It is important to keep yourself hydrated, to prevent illness such as altitude sickness. A portable toilet may come in handy in case of an emergency. Please note that the toilets at the summit might be especially crowded at the time of the goraiko, around 5:00. At an altitude of 2,500 meters or more, various symptoms might occur due to the lack of oxygen. If you have a headache or feel nauseated, do not overreach. You might want to think about descending. To avoid altitude sickness, trek at your own pace and accustom yourself gradually to the high altitude environment. Breathing will become shallow with fatigue, so keep in mind to take a deep breath. Your clothing should not be too tight, to help with the breathing. Another way to avoid the sickness is to keep yourself hydrated. Avoid alcohol and get a good night's sleep before the climb. In case of injury or illness, make a call, or visit one of the aid stations listed below. If you're not sure about the location or have trouble communicating, ask the mountain hut staff for help. Station Hours: Open 24 hours a day. If you are too weak to descend or wandered off the trail, call one of the numbers listed below. In Japan, dialing the number "110" will connect you to the police and "119" to the fire station. 1. Do not vandalize the natural surroundings or the public facilities. 2. Take home your trash. 3. Let other climbers pass first. 4. Do not take pebbles home. 5. Graffiti is strictly prohibited. 6. Do not build tents or campfires. An express bus from Shinjuku, Tokyo, leaves for the Yoshida Trailhead. The ride takes about two-and-a-half hours, and the fare is 2,700 yen. Please check the Fuji Kyuko Bus Official Site. Another express bus, headed for Kawaguchiko Station, leaves from both Haneda Airport and Kansai Airport. If you plan to head for Mt. Fuji directly from the airport, ride this bus, and transfer to the climbers' bus from Kawaguchiko. If you plan to use one of the other trailheads, it might be better to use both train and bus, as this route offers various options. Also, you don't need to worry about traffic jams with this option. This climbers' bus leaves from Mishima Station (JR Tokaido Main Line), Shin Fuji Station (JR Tokaido Shinkansen), Fuji Station (JR Tokaido Line) and Fujinomiya Station (JR Minobu Line). Tourists using the Japan Rail Pass should take this route, by riding the Shinkansen from Tokyo or Osaka. Take the climbers' bus leaving from various stations, and get off at the "Fujinomiyaguchi Gogome" bus stop. The timetable can be seen on this page. (Japanese Link). To learn more about Japan Rail Pass, please read: Tailor-Made Holidays In Japan With Japan Rail Pass. Ride the JR Lines to Gotemba Station, transfer to a climbers' bus and get off at the "Subashiriguchi Gogome" (Subashiri Trail Fifth Station) bus stop. The timetable is listed on this page. Ride the JR Lines to Gotemba Station, transfer to a climbers' bus and get off at the "Gotembaguchi Shingogome" (Gotemba Trail New Fifth Station) bus stop. The timetable is listed on this page. Those who prefer to travel by train can use this route to the Yoshida trail. Ride the Fujikyu Line to either Kawaguchiko Station or Mt. Fuji Station, transfer to a climbers' bus and get off at the "Fuji Subaru Line Gogome" (Fuji Subaru Line Fifth Station) bus stop. For further information, please take a look at this pamphlet. Climbing Mt. Fuji is a quest that even many Japanese people would like to challenge. If you have the chance you should definitly give it a try. Let's Take a Virtual Journey Up Mount Fuji! Fugaku Fuketsu Wind Cave: A Natural Fridge At The Base Of Mt Fuji! This is a revised version of the original article, published on October 20, 2016.